The interaction between clay, slip, glaze, and kiln atmosphere will be central as we consider how these converge with the process of shaping clay to make good pots. This class will explore variety, proportion, and expressive relationships through wheel thrown, functional forms fired in soda and salt. Students should expect to share ideas and develop forms and processes together. Demonstrations, slides, and discussions will help lead us to new ideas and bodies of work. Open to all levels. The pottery I produce is made in stoneware clay and influenced by folk traditions. My aim is to make functional pots that are lively and show the natural beauty of clay and fire. I am drawn to wood and salt/soda firing because of the rich effects these firings techniques have on the clay, slips, and glazes I use. The element of chance is very much a part of these atmospheric firing techniques and brings to play a deep connection between tending the fire and the work within. I am hoping that these elements in combination produce ware that has a warm essence and gives pleasure in use. McKenzie Smith is a potter working in Florida. McKenzie worked as a Core Student at the Penland School of Crafts. He received his BFA from the University of South Florida and his MFA from the University of Florida. Residencies include the Archie Bray Foundation, Banff Center For The Arts, Baltimore Clayworks, and the University of Miami. McKenzie has exhibited widely and taught numerous workshops. In this class, students are asked to bring 10 bisque pots to the workshop. We are limited in time and bringing pots will ensure that we have enough work to fill the kiln. In a week it is hard to make pots, bisque, and fire, so bringing work will prevent us from having to rush the process. Because of space restrictions we ask that you bring small to medium size pots. Please do not exceed 15 inches in height and flat ware must not exceed 18 inches in width. We will do our best to get all the ware into the kiln. Bring some extra bisque along so if we need more work to fill the kiln we have it close at hand. In this regard, a variety of sizes is suggested. Only high fire clay will be allowed in the kiln and it is suggested to use stoneware or porcelain in making pots for this workshop. We will fire to a hard cone 10, so make sure your clay body can handle these temperatures. 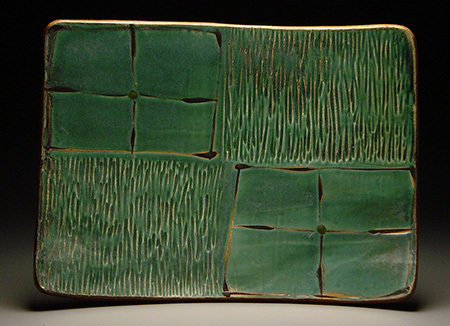 Shakerag will supply the slips and glazes for the firing. Please bring your favorite brushes for decorating. We will also make brushes in the workshop.